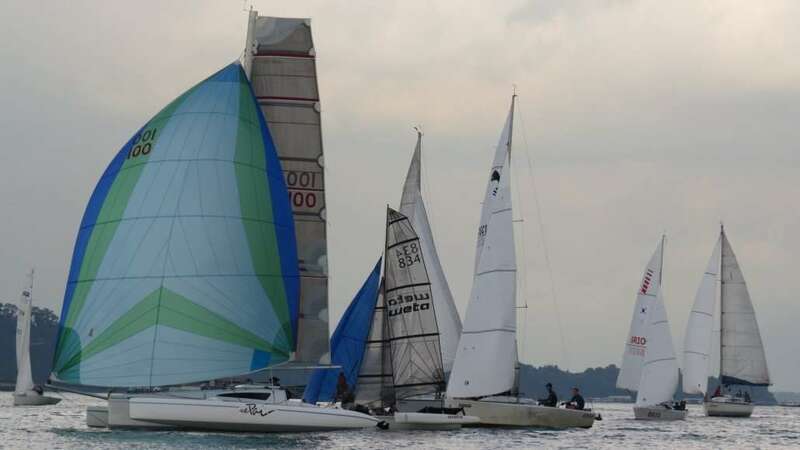 Another weekend in frustrating conditions, as the conflicting weather systems left sailors with a challenging course for race 5 of this Twilight Series. With only 2 boats in the IRC Class, it was a sweet victory for Sky Bird as they notched their first bullet and line honours ahead of Jong Dee. This allows Sky Bird to stretch their lead and strengthen their position 3 points ahead of Jong Dee going into the finale on 1st December. 7 boats contested for podium in the PY class, and it was a close fight at the top amongst the light and nippy boats. Balqis’s gamble paid off handsomely, as they chose to commit early in the race to sail high and close to Pulau Ubin. This allowed her to secure the bullet and line honours, comfortably ahead of new entrant Brio and single-handed Big Bad Wolf in 2nd and 3rd respectively. In the series standings, New Blue Eyes sits on top after 1 discard – a 4 point buffer between them and Minx in 2nd place. Big Bad Wolf’s consistent attendance in the series is reflected in the results, placing 3rd currently. Jaza Too returns to Twilight Racing in style, clinching their first bullet for this series, seconds ahead of Eeepai and Miss Visayan in 2nd and 3rd respectively. Despite their 4th placing, Cicak is tied on points with Eeepai in the Series, setting the stage for an exciting finale next Saturday. Miss Visayan trail the leaders by 5 points, sitting comfortably in 3rd for the Series. The Beach Catamarans were had a pair of Wetas sailing with them yesterday, a refreshing addition to the fleet. sailing on a provisional handicap, the Wetas do well in the light airs, finishing in 1st & 2nd respectively. On official score, Persian Cat sailed well to beat Stray Catz on handicap, scoring their 1st bullet for the series. Their positions are switched in the Series III overall standings, as Stray Catz leads by 5 points, scoring 4 second-place finishes to put them in good stead for the final race. Thank you all for participating in the Twilight Race! enjoy the photos and see you next weekend for the Twilight and Sunday Series Finals!